(1) Firstly, the central city 30km/h zone is planned to be extended south to take in St Asaph St and a bit more of Hagley Ave (plus a slight extension of the 10km/h shared space zone along Oxford Tce). This was first mooted in 2016, but Council voted not to after failing to get widespread support. Ironically, you would struggle to travel much faster anyway, as the current “green wave” synchronised signals along St Asaph is already set to 30km/h (a consequence of being coordinated with the 30km/h wave in the opposite direction along Tuam). The existing lower speed zone is well liked by many people who walk and bike around the central city, but perhaps not surprisingly there have been plenty of grumbles about this proposal to extend the zone. 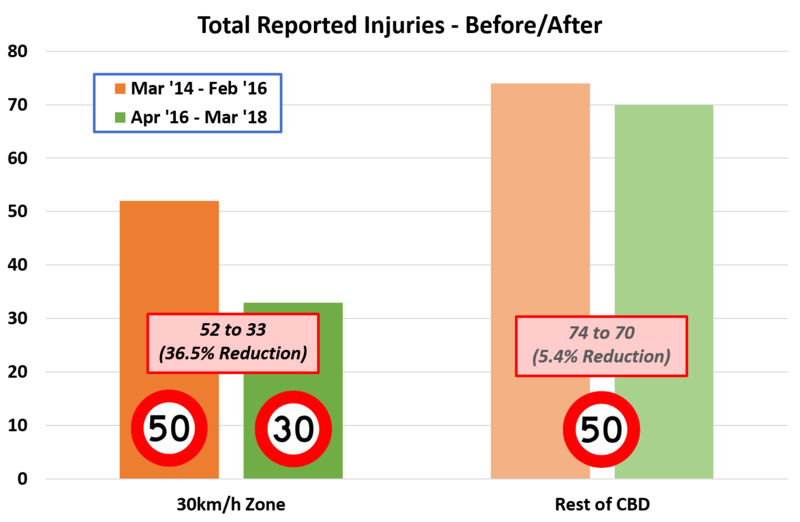 From a safety perspective though, it’s hard to argue with the success of the existing zone after the first two years of its operation, as this crash data shows. Submissions are due by Tue 4th September. (2) The second set of proposals relate to the Quarrymans Trail Major Cycle Route. 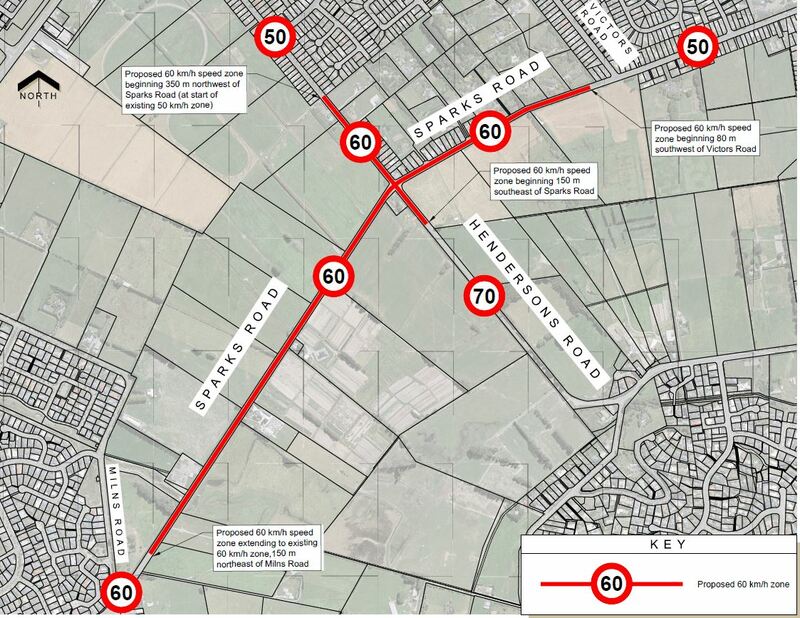 The first part of the route has just been completed, but now there’s a proposed change to the next section along Sparks Rd and an introduction of 60km/h speed limits. The previously proposed two-way cycleway switched from one side to the other at the Sparks/Hendersons intersection. Due to site constraints, the route will now continue along the southeast side of Sparks Rd, and then only cross at a new set of signals opposite the entrance to the Milns Reserve. 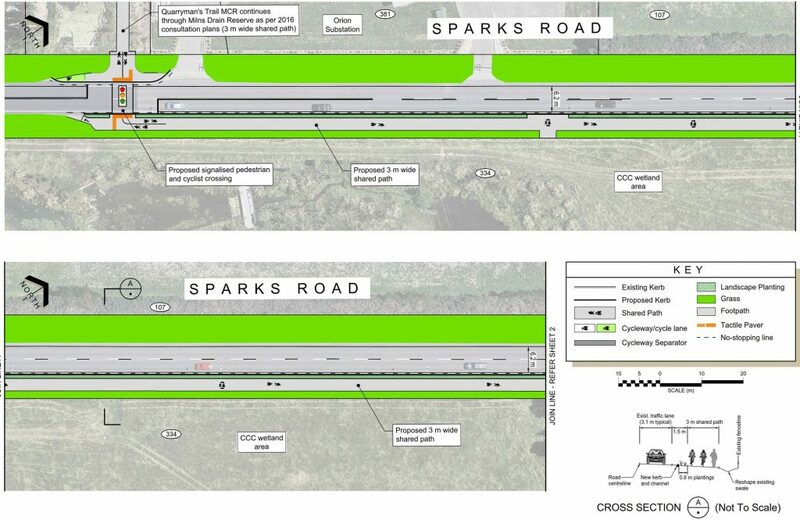 While this swap is no major drama, what might be nice is for the citybound side of Sparks Rd to still retain a decent shoulder for the confident riders who may still wish to stay on the road. In conjunction with this change, there is also a proposal to reduce the existing 70-80km/h speed limits along Sparks Rd down to 60km/h. For those who have had to put up with traffic whizzing past you on a bike here, this will be a great relief (even with a new cycleway to use). Submissions on these proposals close on Wed 12th September. It’s not always a given that Council proposals will actually come to fruition, especially when they are a bit contentious like speed limit reductions. So if you support these projects, then make sure you have your say using the easy online forms. Sharing with pedestrians that refuse to keep left, walk three abreast and with dogs either off leads or on long leads across the whole shared path is ridiculous. If it is meant to be a cycleway then make it so and keep pedestrians on footpaths. It will be the cyclist who gets blamed when a pedestrian is seriously injured in this situation. There is a cultural change required, and it will happen, albeit over a period of time. The place to see how it can happen is South Hagley Park during commuter periods. Walkers know to be on the left. Cyclists know to pass when safe , and allow space. At the weekends however, a totally different story. Cities in Europe with good rates of cycling have plenty of shared zones, we are only starting out on this journey now. Bells are good, as is politeness, and time. Yes, weekends are a total shamble, South Hagley and many other places too. But also later in the day weekdays when all the mothers with prams and deaf retired people that don’t hear my loud bell are walking dogs is often a shamble almost everywhere that I go. More and more people are riding e-bikes, traveling faster and the shared paths are like obstacle courses. It’s amusing how we call for tolerance from those on 4 wheels yet some have no tolerance for ‘deaf retired’ people. I’m both, ride an ebike and wear hearing aids. And lots of ‘young’ people don’t hear my (very loud) horn because they have headphones on. So please, patience everyone – shared means just that. Your missing the point, I too am retired and hearing impaired, the intolerance is of all the NON cyclists REFUSING TO KEEP LEFT regardless of age and abilities. If they would just keep left it would not matter what they did and it would be their own fault if they got a fright as you pass them. The problem is you can’t get past and if you swerve onto the grass to get past you are likely to come off in soft mud etc when wet. Also you need to think about what my original post was related to … The Quarrymans Trail amended plans. Originally it was to be a cycleway from Halswell to Town. But a large section is now proposed to be more ridiculous shared pathway. I was pointing out that shared paths don’t work very well because pedestrians won’t keep left. They end up being obstacle courses . Cycleways need to be cycleways otherwise they are a waste of money. Cyclists seem to know what shared means, but pedestrians and dogs in my experience don’t. 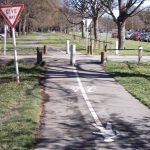 Fortunately I would be surprised if many people walked along this particular section of shared path; it is long and doesn’t connect to much along the way. So in practice, it will be just a cycleway 95% of the time I’d say. I would have thought that about the section of the Little River Link beside the Southern Motorway. As I ride it most days I can tell you that is not the case. There has been massive development of new housing in and around Halswell with more to come. They also have planned swales and park like areas alongside Sparkes Road. So my prediction is that there will be numerous people out for walk with and without dogs. I think is is great that people will likely be using the area for such activities, I just think that if they have the space (and they do) then make two separate paths because they are not going to suddenly start keep left in a hurry. Next Next post: Biking Activities for September 2018 – and Biketober!